Welcome to the International Tandem Surfing Association's growing community of tandem surfers, supporters and fans from around the world. 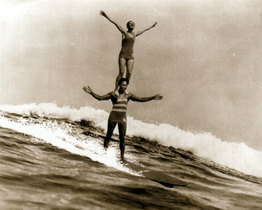 Combining partner lifts with traditional longboarding, the unique sport of tandem surfing has wowed spectators for decades. Starting in the 1920s with the legendary Waikiki Beach Boys, Duke Kahanamoku is arguably the most famous Beach Boy of that bygone era and is also the father of modern day tandem surfing. © 2017 International Tandem Surfing Association. All rights reserved.